We’ve followed Sacramento’s beverage culture for a while, so finally holding the sunny city’s first Caffeine Crawl was wish-fulfillment! 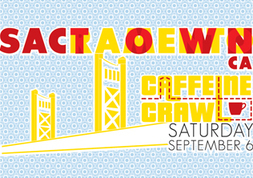 Yet another sold-out Crawl, with lots of press coverage and a huge amount of enthusiasm, Caffeine Crawl Sacto was a wild success. A highlight this Crawl were the killer burlap swag bags from Wholesome Sweeteners, with goodies from Vaneli’s, Chocolate Fish, Insight, Old Soul Co., Temple Coffee & Tea, Shine, Fluid Espresso Bar, Son of a Bean, and Pachamama. Rip Van Wafels, Earnest Eats bars, Wholesome Sweeteners sample packs, and Yelp goodies rounded the bags out. We also had a professional photographer along for the ride who made us look as good as we felt--you can look through the album here. Coffee people in Sacramento are serious about what they do, and their dedication showed at each participating business. We gathered at our three kick-off locations, Roaster sponsors Chocolate Fish Coffee, Insight Coffee Roasters, and Old Soul Co., to pick up swag bags, meet our route leaders, and start the day. Chocolate Fish shared their awesome Nitro Cold Brew with us, Insight offered three different coffees for tasting and discussed processing, Old Soul Co. prepared cascara tea and two different processes of the rare Elida Estate Gesha coffee, and Temple demo’d the new Cold Bruer device. As for the other stops, Fluid Espresso Bar shared vanilla cream Toddy and pumpkin empanadas, Pachamama offered iced coffee and talked about its farmer-owned cooperatives, Shine shook it up with iced matcha lattes and matcha cookies, and Son of a Bean shared pistachio affogatos. As you can see--a wide variety of approaches and drinks! Roaster Sponsor Temple Coffee and Tea hosted our After Party in their spacious roasting facility, with live music, local wine from Revolution Wines, beer from Hoppy Brewing, and a luscious cheese plate from Sacramento Natural Foods Coop. Our friends at Unic set up a Stella di Caffe machine for home baristas and coffee pros alike to throw down on. Sacramento was one of the most rewarding Crawls we’ve executed til now, thanks to the dynamic group of people attending and working the event. We can’t wait to return next year.